Perma Non Slip adhesive is a cementitious material in powder form, which only needs on site addition of water to make a paste which is used for fixing tiles over existing mosaic tiles without removing them. Perma Non Slip Adhesive is also used for fixing tiles on difficult surfaces. Perma Non Slip Adhesive is mainly used for fixing glazed, ceramic terracotta tiles and vitreous tiles, marble and granite tiles on existing mosaic or ceramic floor tiles without removing them or hacking them. Perma Non Slip Adhesive is also used for tiling on difficult vertical cementitious surfaces and in cases where the weight of the tile is more than the normal ones. 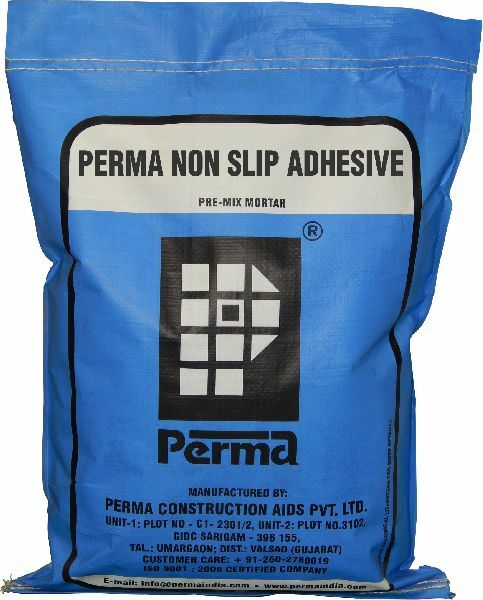 Packing : Perma Non Slip Adhesive is available in 10 Kg. and 25 Kg. multi-wall laminated sacks.